Men demand multipurpose shoes which they can use daily both formally and casually. 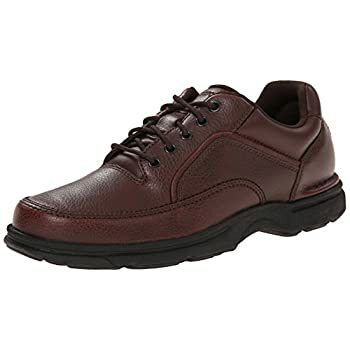 The Rockport Men’s Ridgefield Walking Shoe is the best walking shoes for men serving a lot of purposes. The look of the shoe is such that it can be worn casually and formally as well. This is a productive feature of this Rockport shoe which helps you save considerable money by not spending it on buying another pair of shoe serving a different need. Comfort is guaranteed by the manufacturer which is the main reason for having some satisfied customers of this shoe. A quality pair of shoes can definitely make a difference when it comes to style, comfort and easy walking experience on the go. Whether you are in need of a stylish outfit, a comfortable pair of shoes that will keep your feet like on clouds and gives you an easy walk with no smelly, icky wick sweat in there, you need to have a Rockport Walking shoe. You must be wondering why we can say that when there are lots of shoes and sneakers out there. For sure, all of the various brands come up with some unique features, but here in this Rockport apparel, you get all in one go. ​The Rockport Men’s Eureka Walking shoe comes with an elegant yet tough look made with imported materials and rugged to give it a well-balanced design and look. There is a lace-up vamp that provides a customized adjustment facility along with a heavily padded tongue to let your feet feel comfy and cozy. It is available in 4 different colors including Black, Brown, Chocolate and Chocolate Nubuck. ​The sole has its own unique design with curves and bumps to give you feet a balanced surface for walking comfortably. Due to the flexible, rubber sole, and the shoe is capable of gripping on the ground, no matter if you are walking on a glossy surface or on the road. You can expect a no-slip walk without any troubles. ​The inner sole is bedded with latex foam which means that your foot will rest easy and stay well supported while giving you a cool surface to make sure your skin will not overly sweat while walking. .​Make sure you buy the shoe that actual fits your feet size. Though the Rockport Eureka walking shoe comes with an extra roomy interior cavity, you will need to select the right size to make sure you have the best pair of shoe for you. • Rockport Eureka has a well designed and rugged surface giving it an elegant look that suits along many kinds of outfits. So, you can wear them with a wide range of clothing styles and outfits. ​• The upper leather is not as soft as it should be and does not give a look of full grain leather. The product has been rated as 4.3 stars out of 5 stars online and which is considerably good to declare this pair of shoes and an excellent option for a regular walk. ​The Rockport Ridgefield Eureka Walking Shoe comes equipped with Latex footbed giving super support and flexibility to the feet. Its non-slippery rubber outer sole material makes it ideal to use on all types of surfaces. Then it has a breathable mesh lining which easily allows the air to pass through keeping them sweat-free all the time.